This past weekend, Matt from FreeChurch (ie. 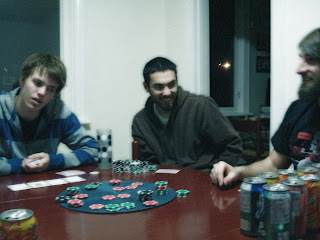 the nicest guy on the planet) invited a bunch of us for a good ol' poker night at his home in Hamilton, which I dubbed The Summit of Men. 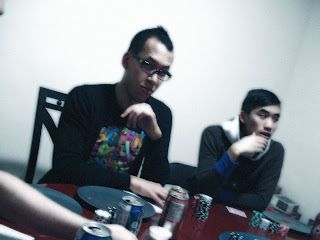 It was a good time but probably one of the strangest poker games that I've played in. First, the n00b player of our game tied probably the most pro player of our group for third place. 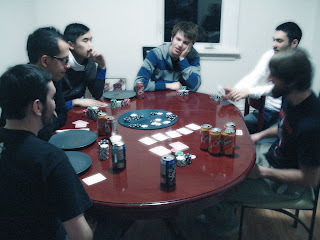 Then there were the number of bad flops that didn't seem to help anyone that much. Thirdly, the dude who looked like he was going to be the first man out of the game ended up winning the whole shebang. And lastly, there were at least 6 split pots throughout the night. Pretty unbelievable. But we all left Toronto as men and returned as warriors, so that was good. It was a good time bonding with my brethren if anything. It's been a while since I've done a movie review, but there are a crapload on the backburner. Really, I just need some time to flesh them out. It's why the past week has seen a few shorter postings. Strange, you'd think that an unemployed geek like me would find time but I find that every day is busy with different random things. Not a bad thing though. Simple post, simple times. Til next time, later geeks!